CURRENT CITIES: Boise, ID; Charleston, SC; Halifax, NS; Little Rock, AR; Portland, OR; Seattle, WA. You need a drink…STAT! So let Cocktail Compass find the happiest happy hours near you. 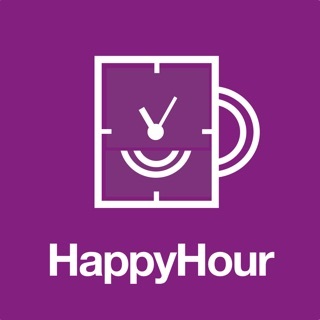 Tap the app and in mere moments you’ll have the nearest happy hour at your fingertips, along with its location, distance, and how long you’ll have before happy hour is over. Need more info? 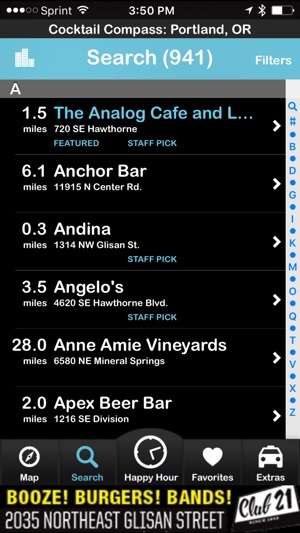 Tap the bar name to see a map of the location, call the bar, or share its info with your friends. 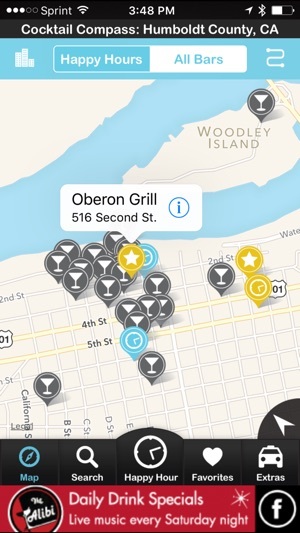 You can also use Cocktail Compass to search for bars in your area, or any neighborhood in your town or in any of the cities included. Check to see if the bar has Wi-Fi or patios (or both!). If you know the name of a bar—or almost remember it—browse the list of bars to find it in a snap! Love a place you found with Cocktail Compass? Make it a favorite and find it again next time—even if your memory’s a bit blurry on how you ended up there in the first place. Having too much fun? At the end of the night, hit the Cabs icon, and call a cab to take you home. With carefully curated content—updated constantly by our staff, so it’s nice and fresh—and reviews and photos for featured listings, you’ll find more fun and cheap deals than you ever knew existed. 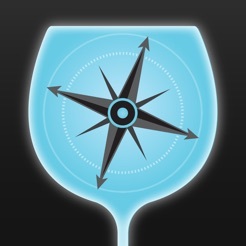 Try Cocktail Compass tonight, and enjoy it always. Have questions or concerns? Please email us at support@allnightstudios.com and we’ll get right on it. Need to report a typo or update bar’s info? Please email to info@allnightstudios.com. We've all had that problem. You suddenly have a thirst that only a happy hour beverage will quench (and some cheap nibbles wouldn't be amiss either). But where to go? Will it still be happy hour when you get there? And how will you get home safely after you slake your thirst? Cocktail Compass to the rescue! Sure, the interface is looking a little dated at this point. But it solves all these problems and does it well. In short order, it will tell you where the nearest happy hours are and how long you have to eat and drink to your heart's & liver's lament. Often, it will also tell you a little bit about the scene, so you can show up appropriately attired whether it's skinny jeans, slacks, or your best lumberjack outfit. And, if you overdo it, they even have a taxi button (Sorry, no Uber/Lyft yet). 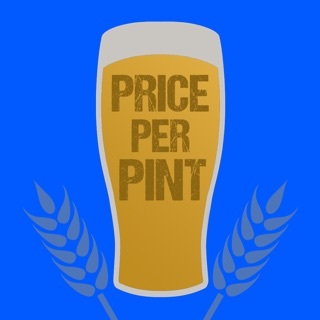 So download the app and go grab yourself a tasty drink and some victuals! Love this!!! More cities, please!!! 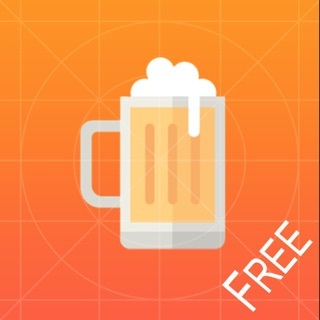 My BF and I stayed in an AirBNB in Seattle, and our host told us about this amazing app, which we IMMEDIATELY downloaded, and used the whole week we were visiting!!! 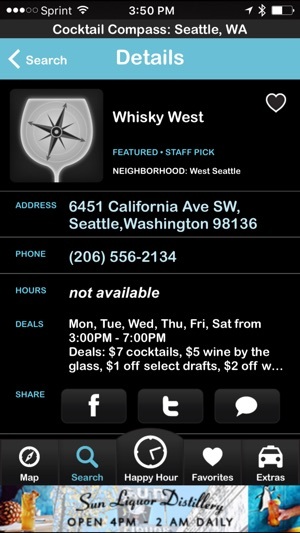 The happy hour specials were right on, and it REALLY helped us stay on budget and find some hidden gems in Seattle. I can't wait to go back just to use this app!!! Please update with more cities!!! I travel a lot for work, so I'll use it for sure!!! I love this app! It has helped me find so many great happy hours and explore new bars I never would have found on my own. 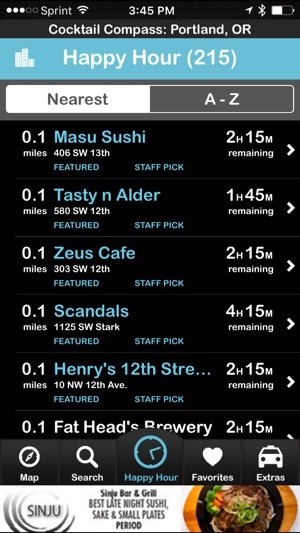 I really love how it shows exactly how long (down to the minute) I have till each happy hour ends, so I can easily determine the best place to go depending on when I think I'll get there.